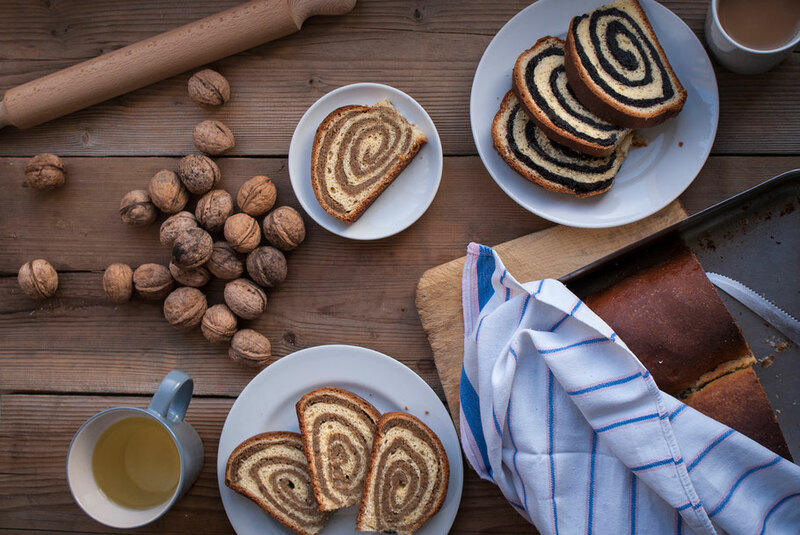 Makovnjaca and Orehnjaca: a traditional Croatian cake with walnuts and poppy seeds - Cooking along the Drava. Croatian traditional food, travel and landscape. A typical sweet of Northern Croatia. 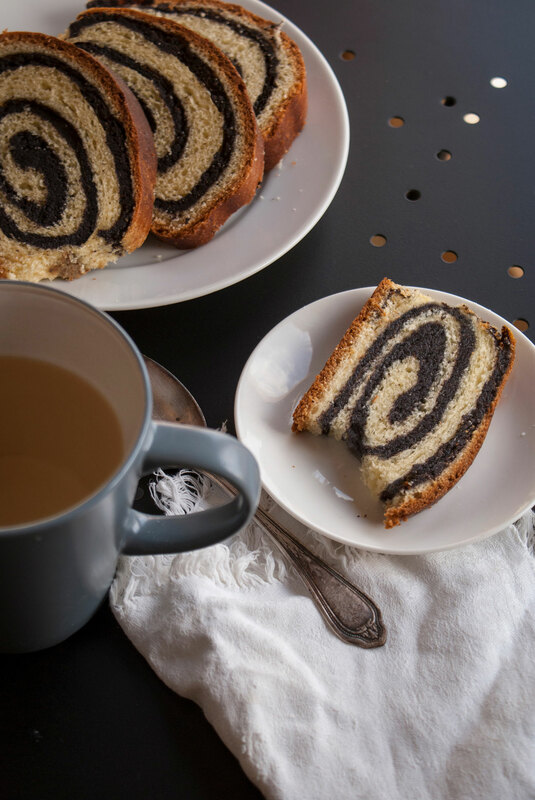 Absolutely my favorite, with a stuffing of nuts or a filling of poppy seeds. This is the cake that reminds me of my childhood more. 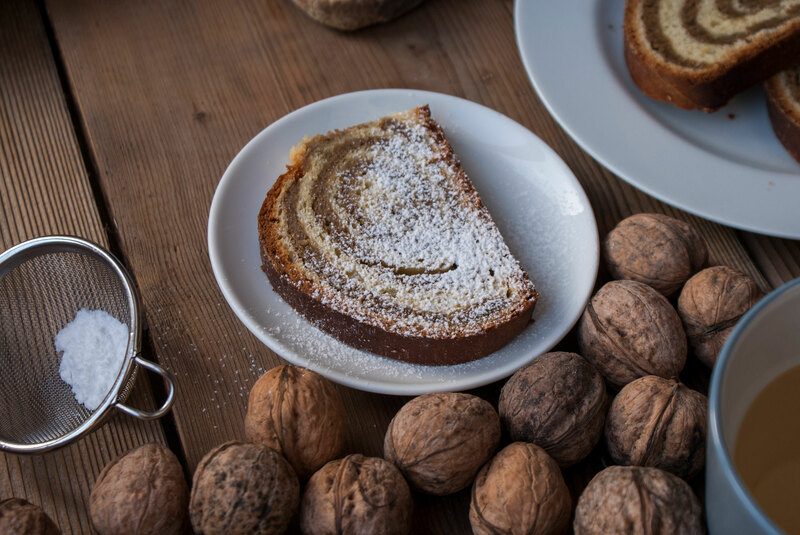 It was made for great occasions, and always in pairs: one with the stuffing of nuts and the other with filling of poppy seeds. My grandmother called it Gužvara. 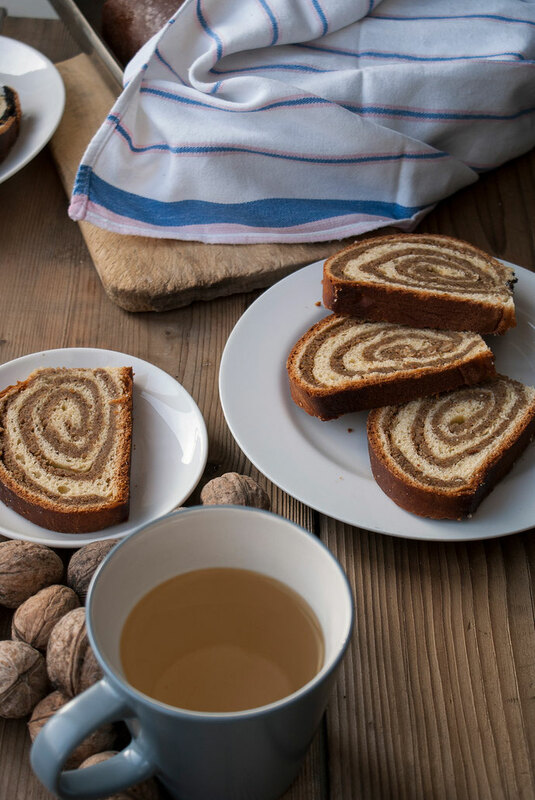 But I later discovered that it is called differently, depending on the filling: Makovnjača with poppy seeds, and Orehnjača with walnuts. My grandparents struggled a lot to make this sweet. They had a special tree that produced very difficult nuts to shell out. First they used a nutcracker and then a small pointed knife. Poppy seeds were produced by my grandmother. My grandfather ground these seeds for a long time with a curious instrument. A sort of hollow tree trunk where the seeds were introduced and then beaten with a stick. I still remember the dull noise it produced. The sweet, freshly baked must be shaved with water and sugar for a crisp crust. And then my grandmother had a very strict rule: never cut it before it was completely cold. And this was the hardest part for us kids, because we had to wait for hours. Although laborious is a very simple sweet: it is a dough for bread enriched with eggs and butter. 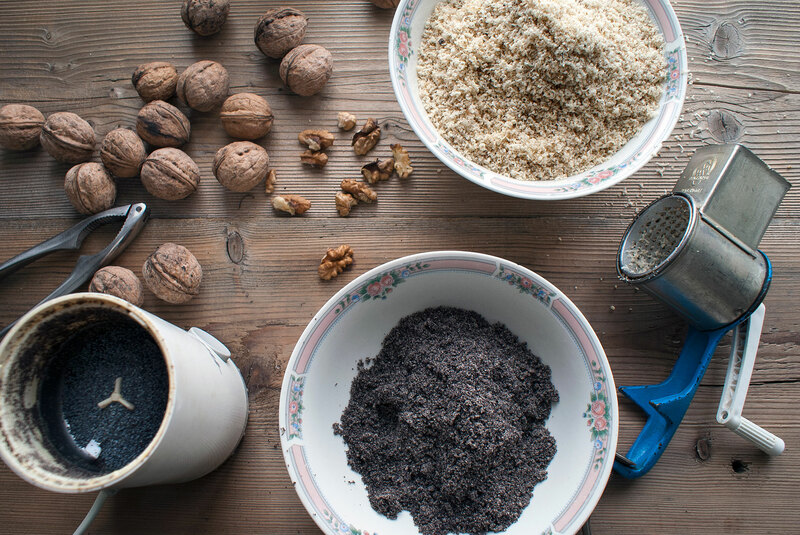 Even filling is very simple: nuts and sugar, or poppy seeds and sugar. Now, for filling, also use raisins, rum, chocolate, cinnamon, lemon peel and more. But I prefer the simple version, and that's what I propose to you. 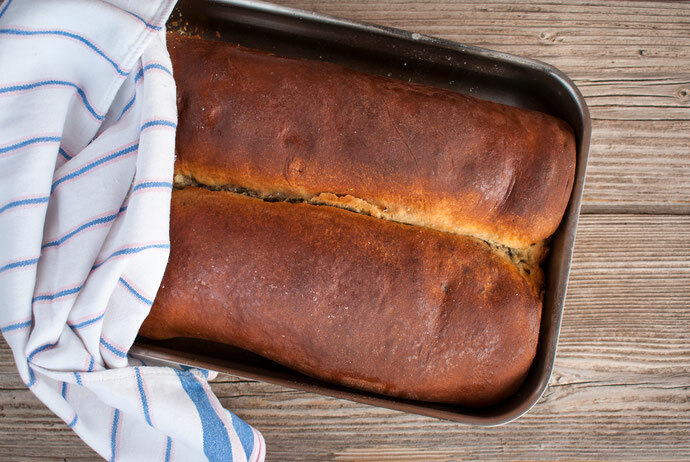 The recipe has been developed with years of experience because my grandmother's recipe is absolutely imprecise: for example she speaks of flour without indicating the quantity, sometimes she says "a bit of", and so on. The dough must have a very soft texture and must be elastic at the same time. My grandmother worked the dough with a wooden spoon until got away from the terrine walls and then worked on the wood board. Once I have tried it: it is very tiring and in the end, after about an hour, the miracle happens, and the dough starts to break away from the walls! 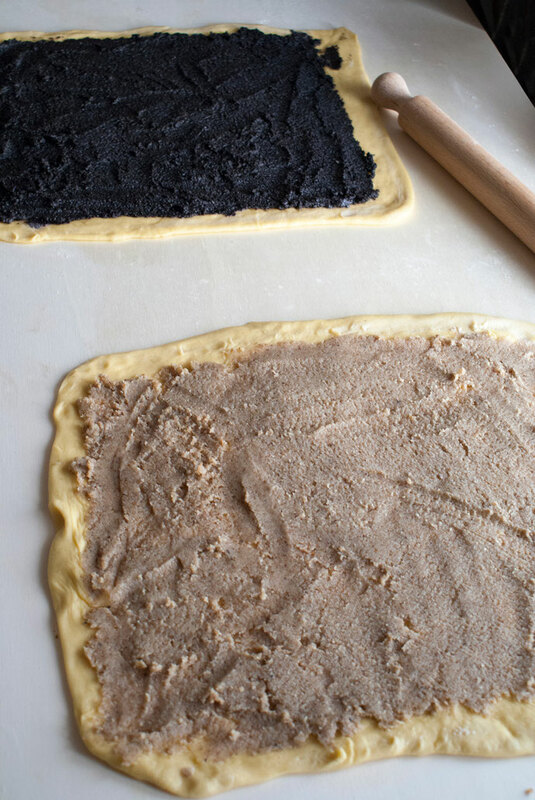 Take the dough with your hands and work it in the air until the dough breaks out of your fingers. At first it seems impossible, but then it happens! And the same is good. My grandmother insisted to sift the slices with the icing sugar, but we didn't like it because we no longer saw the spiral drawing. Make a little dough with 100 g of flour, yeast, sugar and a little milk and make it grow under a cloth. 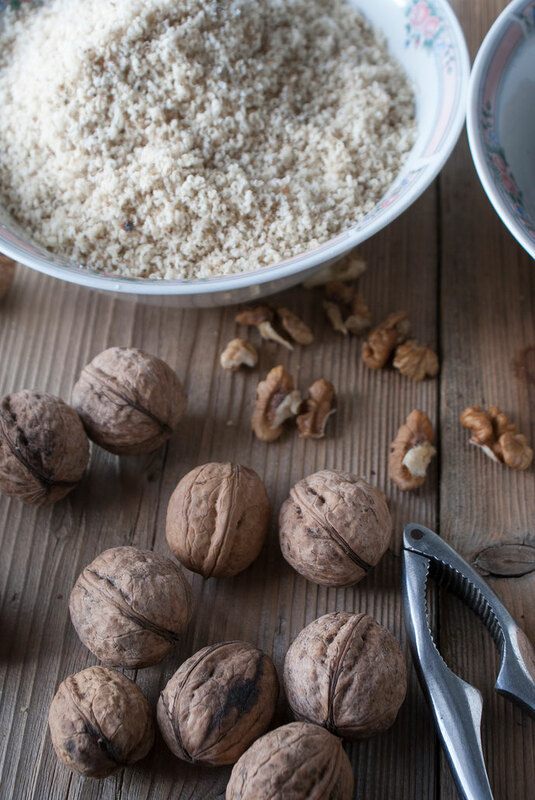 Meanwhile, grate the nuts and grind the poppy seeds with a coffee grinder (a little bit at a time). Prepare the two fillings by adding 100 g sugar for each and a few tablespoons of milk until the ingredients are mixed. Never use too much milk. Quickly mix 400 g of flour with butter, eggs and salt. Add the small dough and work with hands until it fades from fingers. Divide the dough into two and spread two rectangles. The shorter side must be equal to the length of the pan. 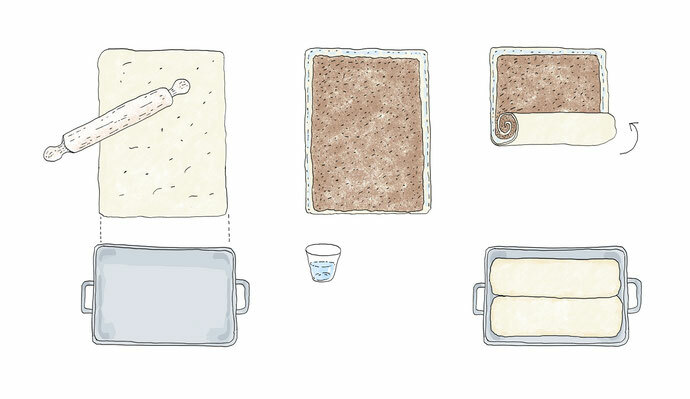 Spread the fillings on dough rectangles, leaving a small edge that will damp with a little water. Wrap starting from the short side. Place the two rolls in a baked pan and cook at 180 degrees for 45 minutes. Place sugar and water in a small pot on a slow fire, until the sugar is dissolved, and let it cool. As soon as the sweet is cooked, spread the syrup over the top and let it cool.